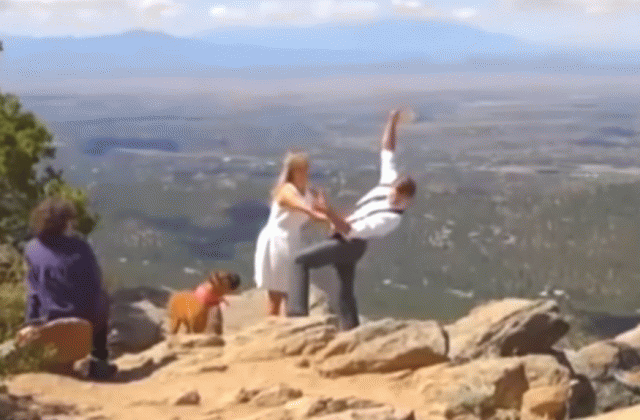 While a couple renewed its wedding vows during a ceremony on the edge of a cliff in Santa Fe, NM., the wife saved her husband from falling over the edge and nearly dying. Peter Bolton and his wife, Faith, who have been married since 2009, decided to renew their vows in front of a few friends and family members. While reading his vows, Peter animatedly raised his arms into the air, slipping from rock he was standing on. As Peter lost his balance and people were watching the incident unfold, Faith grabbed her husband's arm, saving him from plunging to his death. The spectators laughed as if they knew Peter was going to lose his balance the entire time, and many who have since seen the video believe the trick was pre-planned. Either way, Peter performed an extreme trust fall while renewing vows with his wife. Watch a woman save her husband from falling off a cliff in the video here.